Whether the kids have their new lunchbox from Santa ready to go, or you’ve just asked your pre-teen where theirs is (and found it at the bottom of their school bag complete with last years unfinished wrap): the thought of another year of making, wrapping and sending off original, nutritious, tasty and ‘on trend’ lunches (which may or may not be eaten) gives some parents nightmares. Lunch box stress is something parents have created for themselves! And I’m going to help you cut that stress now. Simple is best: ‘simple’ is the most nutritious: ‘simple’ is most likely to be eaten: ‘simple’ is the cheapest: ‘simple’ will save you some stress! Fruit: most schools have a compulsory fruit break before lunch. Compulsory or not, a piece of fruit in the morning is a great idea for several reasons; it’s a quick energy hit as breakfast was eaten sometimes 3-4 hours earlier, most have a decent fibre content to keep bowels happy, vitamins and minerals (obviously these vary between fruit types), natural sugars for keeping brains working through until lunch; but most importantly a piece of fruit does not require any preparation from you! Think old school favourites when it comes to fruit; apples, bananas, mandarins, grapes or seasonal stone fruit. Berries are great too, but these can be expensive, and they require a little preparation. Trust me, your child will not be the only one in the class without an exotic fruit salad, so throw that banana in! Protein: I quite often see patients who do not eat any protein between breakfast and dinner. Protein is very important for growing bodies! Protein also helps us to feel full. So, if your kids were coming home from school ‘starving’ last year, perhaps you need to think about adding some extra protein into their lunches this year. Proteins containing foods include meats, beans and legumes, nuts and seeds and dairy. Fancy products like ‘protein balls’, ‘protein bars’ and ‘protein drinks’, also contain protein, but these don’t have the advantage of the extra vitamins, fibre or macronutrients that come from whole food sources. 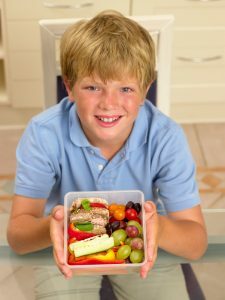 Some additional lunch box protein suggestions; rotisserie chicken in a sandwich, sliced lean meats in a sandwich, canned tuna/fish, Greek/natural yoghurt, hummus or other bean dip, baked beans, eggs, plain milk, nuts or seeds (if your school is allowed), roasted chickpeas or other beans, cold vegetarian sausages, falafel. Carbohydrate: Carbs give our kids the fuel they need to keep running about in the playground and stay awake during class. Remember simple is best. And the simplest way to include some carbs (preferably from wholegrain sources) is with a sandwich! They’re easy to hold, fillings are less likely to fall out, they’re cheap and they’re so easy to put together that you can alleviate some of your stress and get kids to make their own (especially if they’re over the age of 9!). Rolls, wraps, pockets and crackers are also excellent sources of carbohydrates. Choose wholegrain varieties as they keep the children fuller for longer. Dairy: We all know that dairy is good for growing bones and healthy teeth because of high calcium, but did you also know that dairy is a source of vitamin B12, riboflavin and protein? Add dairy to lunchboxes in the form of cheese sandwiches, yoghurt or plain milk primers. To keep dairy fresh on hot days, you can freeze milk/yoghurt or add in an ice brick. Milk is a great for extra hydration on hot days too, which is an additional bonus. Hydration: The best and simplest hydration is water. But how much water should kids be drinking? As a rough guide; 5-8 years = 1L/day, 9-12 years = 1.2L/day and 13+= 2L/day. Especially during hot weather! 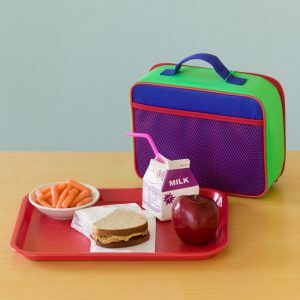 Plain milk or flavoured water (with fruit pieces) are also excellent lunchbox additions. Fruit juices that are natural and unsweetened are ok occasionally but shouldn’t be used instead of a piece of fruit, there’s so much additional benefit to chewing your fruit! Fizzy drinks are never appropriate for lunchboxes. Vegetables: I know I’ve left these off the essential list! It doesn’t mean I don’t think they’re important, just an added lunchbox bonus if you add some in. 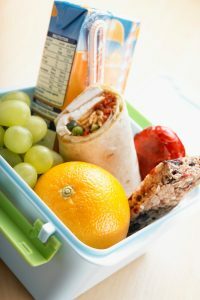 Great ways to send vegetables to school in lunchboxes are sticks; carrots, cucumber, celery, capsicum, as mini veg; tomatoes, cucumbers and of course as a sandwich ingredient; avocado, lettuce, etc. Very few children will eat a big salad for lunch especially from a lunchbox. Lunchbox treats: There was lots of media last year about lunchbox shaming by teachers due to strict ‘treat’ policies. I personally hope we left these attitudes towards food back in 2018! As a paediatric dietitian, I believe that all foods have their time and place and understand that some food nourishes the body and some the soul. These policies send a message to children that there are ‘bad’ foods which have the potential for repercussions down the track. Treats have their place, in moderation. However, if your school has one of these awful policies, try and stick with it as best as possible and keep treats for at home. Your child will better survive without the lunchbox Freddo frog and a classroom shaming. Your stress levels will be better off too without the note home from school! To decrease stress for your child at lunchtime always show them what’s in their lunchbox before school. If there is something new and you think it will cause some stress – talk to them about it. Try to avoid adding foods you know they’re vehemently against, especially if it will cause the rest of the lunchbox to be avoided too. Remember, they’re away from you, their safety net while they’re at school, and if food is usually a stress or struggle for them try to support them through this. A little love note or smiley is always appreciated!. Please note: advice contained in this blog post is general in nature and may not be suitable for all children or families (especially those with varied diet requirements). For more individualised advice please see one of CCH’s paediatric dietitians.